The Pantone Colour of the Year for 2006 is Sand Dollar 13-1106. 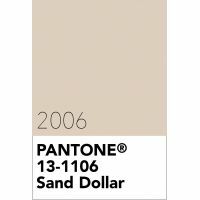 Pantone Sand Dollar 13-1106 is considered to be a neutral colour that expressed Pantone's concerns about the 2006 economy. While most other Pantone colours of the year are brighter, this neutral shade is warm and fed into the trend of natural and organic. Sand Dollar 13-1106 is from thePantone Fashion, Home + Interiors colour library. Pantone Solid Colours in print: Not available. Pantone CMYK Reproduction: Not avilable.